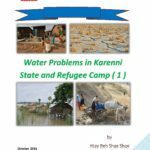 Every year our students conduct research on various issues in Karenni Refugee Camp #1. We also conduct independent research on issues in Karenni State. Our most recent report is on land confiscation in Karenni State. You can find our publications below.